We’d love your help. Let us know what’s wrong with this preview of An Unfamiliar Murder by Jane Isaac. To ask other readers questions about An Unfamiliar Murder, please sign up. Quietly, he opened the boot and, as he lifted the dirty holdall, winced slightly. The bricks inside made it heavy and he congratulated himself for deciding to drive down. It would have been cumbersome to carry any distance. Walking towards the water’s edge he started swinging the bag, gently at first and then faster and faster until he eventually swung it out into the water. It sat there for a split second, the surrounding water bubbling at its side, examining its new gift, before encasing it, p Quietly, he opened the boot and, as he lifted the dirty holdall, winced slightly. The bricks inside made it heavy and he congratulated himself for deciding to drive down. It would have been cumbersome to carry any distance. Walking towards the water’s edge he started swinging the bag, gently at first and then faster and faster until he eventually swung it out into the water. It sat there for a split second, the surrounding water bubbling at its side, examining its new gift, before encasing it, pulling it from sight. Breathing a sigh of relief he stood there momentarily, again listening for any sound of life. He heard a rustle in a nearby tree. A bird emerged, disturbed on its roost by the splash of water. Then nothing. Walking back to the car, he placed a hand in his trouser pocket and pulled out a box. Removing a short stalk of wood, he struck it and threw it on to the back seat. Hovering a few feet away, he watched as the flames licked through the interior, fascinated by the power and destruction contained within one match. Finally, satisfied, he turned up his collar and started walking back up the track. Round one complete. Now for round two. An Unfamiliar Murder by Jane Isaac is the first book I've read by this author and I thoroughly enjoyed it. The storyline is original and believable that moves at a fast pace and keep me reading from cover to cover. I really liked DCI Helen Lavery as she is hardworking and determined to solve her first murder investigation before the higher-ups hand over the case to a more experienced detective. What sets this book from many crime stories featuring female detectives is Helen's personality. She is generally happy, fair, and patient, addressing her team members by their first names which is refreshing. It's not a gory, horrific crime scene which is different from many of the books I read, nevertheless, it's exciting, thrilling, which made me reluctant to set it down and I read it in two sittings. This is a cracker of a crime thriller and had me hooked from the beginning. Anna Cottrell arrives home at her flat from work, expecting just to have a quick change of clothes before going to her parent’s 30th wedding anniversary celebrations. Instead she finds a dead body in her lounge and is then arrested and questioned for murder. DCI Helen Lavery is the senior officer in charge. This is her first murder case and she has to prove herself, not least to her boss, who is getting impatient for res This is a cracker of a crime thriller and had me hooked from the beginning. Anna Cottrell arrives home at her flat from work, expecting just to have a quick change of clothes before going to her parent’s 30th wedding anniversary celebrations. Instead she finds a dead body in her lounge and is then arrested and questioned for murder. DCI Helen Lavery is the senior officer in charge. This is her first murder case and she has to prove herself, not least to her boss, who is getting impatient for results and wants to bring in someone more experienced ‘to assist’. As well as hunting for the killer, she also now has the added pressure that she may be taken off the case if she doesn’t get a quick enough result. As much as I love psychological thrillers, I do enjoy a good solid police procedural crime story. This one has some excellent characters and Helen Lavery stands out. A widow, with two teenage boys and her mother at home, she not only has to cope with a murder enquiry, and one colleague in particular being particularly awkward and obstructive, but teenage angst too. Although unlike many, she has live in help from her mum, she is nonetheless forever trying to achieve that impossible work/life balance that comes with a demanding job. Although focussed and ambitious she instinctively knows when to show compassion as demonstrated in some scenes with Anna. She is also astute enough to pick her battles wisely, particularly with the aforementioned colleague! Anna was someone I had great empathy for – she certainly has a lot to deal with (besides being a murder suspect) and considering the emotional turmoil she faces, she appeared to be a strong character. There were times however when I was exasperated with her, particularly when she seemed to ignore common sense and took risks that could place her in danger. At times I found myself silently shouting at the pages ‘noooo DON'T do that’! I don't want to give away any of the plot but this was a taut and well written crime thriller with a suspenseful storyline that kept me wondering about certain characters throughout; I was never quite sure who could be trusted - no doubt this was the author's intention and if so, she certainly succeeded. 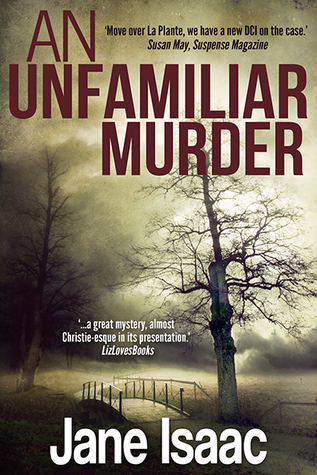 An Unfamiliar Murder is the author's first book and was originally released in 2012. After having been published in the US it is now being re-issued in the UK. Wow!!! Jane Isaac's first crime novel takes my breath away! It is just that excellent a read; beautifully and confidently written and impossible to put down once you start. I love the start of the book. It pulls you into the mystery and introduces a strong female lead in Anna. Anna Cotterill comes home after work, to find a dead body in her flat. She is suddenly behind bars, questioned by the police and totally bewildered by events. The world, as she knew it, is about to change. For Anna's life h Wow!!! Jane Isaac's first crime novel takes my breath away! It is just that excellent a read; beautifully and confidently written and impossible to put down once you start. I love the start of the book. It pulls you into the mystery and introduces a strong female lead in Anna. Anna Cotterill comes home after work, to find a dead body in her flat. She is suddenly behind bars, questioned by the police and totally bewildered by events. The world, as she knew it, is about to change. For Anna's life has been shrouded in secrets and they are all about to be revealed. The investigation into the murder is led by DCI Helen Lavery. She is a widow with two teenagers, living with her mum. She is a great character, with an inner strength and intelligence and a match for anyone who seeks to undermine her. This is her first case and I hope we have many more to come. Thank you to Jane Isaac and The Book Club TBC for allowing me to read this book in return for an honest review. Anna, a teacher at a local school is heading home after a long day, not a care in the world. On reaching her flat, her front door is open...questioning whether she locked it when she left that morning she steps into her flat. Cautiously moving forwards she senses something is definitely wrong. Grabbing a knife from the kitchen she steps into the living room and there he is....the man fa Thank you to Jane Isaac and The Book Club TBC for allowing me to read this book in return for an honest review. Anna, a teacher at a local school is heading home after a long day, not a care in the world. On reaching her flat, her front door is open...questioning whether she locked it when she left that morning she steps into her flat. Cautiously moving forwards she senses something is definitely wrong. Grabbing a knife from the kitchen she steps into the living room and there he is....the man facing her is dead. covered in blood, eyes wide open and seemingly staring at her....who is he and why is he in her flat? DCI Helen Lavery is leading the investigation into the murder of the man found in Anna's flat, a man unknown to Anna yet she is the chief suspect. So many wonderful characters within this book who all compliment each other, the slightly nervy DCI, Anna's parents who are not all they seem. Ross, Anna's boyfriend who gets caught up in the melee, and the secrets that always come out when you least expect them. I received this as an arc from the book club (tbc) in exchange for an honest review. Anna arrives home her front door has been forced open. Someone has broken in. When she goes in to investigate she has a shock. There is a dead body in her living room. She has no idea who he is. Or why he was left in her home? DO I Lavery and her team has to find out who killed him and why? Anna was my favourite character. I a I received this as an arc from the book club (tbc) in exchange for an honest review. I also liked Rab and Ross too. I received a copy from TBC for an honest review. Thoroughly enjoyed this book, the first chapter pulled me in to keep on turning the pages. The characters were likeable, realistic, believable. There was a good balance of back story, home life and relation to what was going on on the book. I shall definitely continue with the series. I loved this book. It was provided free of charge on the basis that I reviewed it honestly on Goodreads and Amazon. I would happily have paid for this one – it was fab! I hadn’t read any of Jane Isaac’s work before – needless to say I will be reading the rest. The characters really worked for me. Helen Lavery was fabulous. Just the kind of DCI we would all want assigned to the case if we went home to find a murder had happened in our living room. Loved the tension over the suggestion of bringing I loved this book. It was provided free of charge on the basis that I reviewed it honestly on Goodreads and Amazon. I would happily have paid for this one – it was fab! I hadn’t read any of Jane Isaac’s work before – needless to say I will be reading the rest. The characters really worked for me. Helen Lavery was fabulous. Just the kind of DCI we would all want assigned to the case if we went home to find a murder had happened in our living room. Loved the tension over the suggestion of bringing someone in to ‘mentor’ her in her first murder investigation when she was clearly bright enough not to need it. And she was a police officer with a home life that wasn’t completely dysfunctional (with a bit of help) or sacrificed to the job. Edward Cottrell was a joy. All children should have someone like Edward in their lives; he should be a mandatory male role model template to create valued and rounded grown-ups (and happy, secure children). It was also good to find someone in the novel with a criminal past created as a ‘real person’ and not just shown in relation to the crime that was committed or used only as an agent of the plot. My only concern, and others may not agree with me, is that the ending came too soon. I don’t mean because I wanted to go on reading and reading the book (even though I really did) but the ending felt very swift compared to the work that had gone into making the rest of the story so effective. I would have preferred it to be more drawn out – maybe another 10% added to the book (easy for me to say when I wasn’t the one nurturing it on to the page!). Despite this I really did love it and read it in one sitting so it’s a five from me. I'd previously read (and disliked) The Truth Will Out by Jane Isaac but her books consistently get good reviews so I thought I'd give it one more go. I enjoyed this book more than the sequel but can't say that I'll ever be a huge Jane Isaac fan. Its a bit strange I know but thankfully we all have different tastes - otherwise there would not be enough dark chocolate in the world! While this book moved at a slightly faster pace it was still too slow for my liking. And the rationale given for the mu I'd previously read (and disliked) The Truth Will Out by Jane Isaac but her books consistently get good reviews so I thought I'd give it one more go. I enjoyed this book more than the sequel but can't say that I'll ever be a huge Jane Isaac fan. Its a bit strange I know but thankfully we all have different tastes - otherwise there would not be enough dark chocolate in the world! While this book moved at a slightly faster pace it was still too slow for my liking. And the rationale given for the murders, when they eventually identified the killer was, I thought, a bit lame. Actually I've noticed that if I have to turn the pages real fast I overlook the plausibility factor a bit, and I think some others do as well. Therefore a slow book gets picked on more, sad but there you have it. Anna's life is turned upside down when she returns home to find a dead body in her flat; and not someone she knows, a total stranger. From that moment on, nothing will ever be the same for her in more ways than just(!) finding a dead body! I really enjoyed Jane Isaac's debut novel. I actually thought this was better than "Before Its Too Late" which I read last year. I really felt for the two lead characters. Anna flung into the centre of a murder enquirer of a man she's never heard of and every Anna's life is turned upside down when she returns home to find a dead body in her flat; and not someone she knows, a total stranger. From that moment on, nothing will ever be the same for her in more ways than just(!) finding a dead body! I really felt for the two lead characters. Anna flung into the centre of a murder enquirer of a man she's never heard of and every conversation she has, she uncovers another secret. DCI Helen Lavery is a single mother with two teenage boys, trying to prove herself in a male dominated world. I felt the story really flowed with a typical police investigation uncovering clue after clue. I thought I had the culprit sussed and then no, Lavery and the team uncover something to prove me wrong! I'll definitely be reading Jane's other DCI Lavery story, "The Truth Will Out" to see how the relationships develop and what other investigation she gets involved in. And I am looking forward to Jane's next release later this year! It appears that I've now managed to read all three of Jane Isaac's books in reverse order! However, this certainly hasn't distracted from how excellent all of them have been. I love Isaac's style of writing. Storylines are original but beautifully crafted to grab your attention and pull you in. This is It appears that I've now managed to read all three of Jane Isaac's books in reverse order! However, this certainly hasn't distracted from how excellent all of them have been. I love Isaac's style of writing. Storylines are original but beautifully crafted to grab your attention and pull you in. This is a fast-paced crime thriller that twists and turns as the characters' relationships and lives begin to intertwine with each other. It continues to build on the momentum as family secrets and betrayals are revealed and keeps you guessing right through to a real show-stopper end. Once again, an outstanding read from Isaac that will no doubt race through to the best-sellers during 2016. A solid five-stars from me. Many thanks to the author for the ARC copy. I would like to thank TBC and Jane Isaac for giving me the opportunity to read this in exchange for an honest and open review. What a fabulous read. It was one of those books that pulled you in at the first page and didn't let you go until the end. DCI Helen Lavery is a strong willed character who is trying to do what a lot of women do, that is achieve the right balance between her home life and her career. I liked her immediately and found myself caring for her and her family. In fact all the cha I would like to thank TBC and Jane Isaac for giving me the opportunity to read this in exchange for an honest and open review. DCI Helen Lavery is a strong willed character who is trying to do what a lot of women do, that is achieve the right balance between her home life and her career. I liked her immediately and found myself caring for her and her family. In fact all the characters were extremely believable, even the 'baddie'. Brilliant book. Had me gripped from the beginning. The characters are believable and engaging. Helen Lavery comes across as a dedicated if slightly nervous detective running the show for the first time. Anna Cottrell is a strong lead and made me sympathize and want to shake her at the same time. Read it in two sessions and am looking forward to reading more from this author. Well done. Really good mystery and story. You know it is going to be a page-turner when in the first chapter a strange body turns up in the home of the protagonist, Anna Cottrell, who is not a spy but just your average school teacher. After the police accept Anna is not the murderer and release her, she then discovers that she and the murder victim are linked and that perhaps her past is not exactly as she was led to believe. What is even more frightening is that those past secrets could quite possibly place her and her boyfriend Ross in extreme danger. When he goes missing Anna determines she must uncover those secrets or she may never see Ross again. Also attempting to unravel the secrets is investigating officer, DCI Helen Lavery, an ambitious woman who juggles her very demanding job life with that of a single Mom to teenage sons. When Anna Cottrell’s murder case lands on her desk, she soon realizes it is far more complicated than she first expected. After DNA evidence leads her on a chase through Anna’s family tree, she begins to fear that if she cannot find the killer soon there will be more victims. Readers are certainly taken on a merry chase following DCI Lavery as she solves the murder. Isaac felt that very early on in the writing of her debut novel she could do a lot more with Lavery’s character and is currently working on a sequel to ‘An Unfamiliar Murder’, and there are also plans for a third book in the series. It would seem that for the new found fans of Helen Lavery, she will become very familiar to readers in the next few years. An Unfamiliar Murder is the first book in the DCI Helen Lavery series. The author had my attention straight from the start. I mean to come home to find a stranger there, and a dead one at that, well it certainly had me hooked. Anna is your every day type of young woman and to be honest things kind of go down hill for her after finding the body. Her whole existence to a certain extent comes under question after finding out a web of lies about her past. I think I was as shocked as her at some of the An Unfamiliar Murder is the first book in the DCI Helen Lavery series. Anna is your every day type of young woman and to be honest things kind of go down hill for her after finding the body. Her whole existence to a certain extent comes under question after finding out a web of lies about her past. I think I was as shocked as her at some of the revelations and it certainly makes for a great storyline. DCI Helen Lavery, I really liked. She is very grounded. She is trying her best to juggle work and family and she is certainly finding it hard at times. You can tell at times that trying to get the balance right leaves her feeling guilty. I think a lot of working mothers will be able to relate to Helen and she is a great role model. The pace of the story is quite steady though I certainly could feel the adrenalin kick in towards the end when it started picking up. As usual I had no clue who was behind the murder and the disappearance of Ross, Anna's boyfriend. My couple of attempts at guessing were way off the mark, which is nothing new and the reason why I'm not part of the police force! An Unfamiliar Murder is a great start to a new series that I can't wait to read more of. AN UNFAMILIAR MURDER is a well crafted mystery that keeps the reader guessing. Just when you think you know "who done it" the plot takes another turn. The story is fast paced and believable. It kept my interest, never lagging, and I ended up reading it in one night. Author Jane Isaac certainly has a gift for weavng a story, one filled with a diverse cast of characters, different from one another and yet, every one of them well developed, interesting, and believable. The story opens with the heroi AN UNFAMILIAR MURDER is a well crafted mystery that keeps the reader guessing. Just when you think you know "who done it" the plot takes another turn. The story is fast paced and believable. It kept my interest, never lagging, and I ended up reading it in one night. Author Jane Isaac certainly has a gift for weavng a story, one filled with a diverse cast of characters, different from one another and yet, every one of them well developed, interesting, and believable. The story opens with the heroine, Anna, arriving home to find a dead man, a stranger, in her flat. As events unfurl, the mystery intensifies. Without giving anything away, the reader isn't always sure who Anna should trust. Just as she does with Anna, the author arouses conflicting sentiments in the reader about those most close to the heroine. We want to like someone but don't know if they're really good or bad. At every bend, secrets are revealed, Anna discovers things about her past she never knew, and the underpinnings of her entire belief system begin to crumble. This is the first of Jane Isaac's books that I have read, but I can tell you that it definitely will not be the last! Anna arrives home after work, and to her surprise finds the body of stranger in her apartment. Of course she becomes the first suspect, but her alibi checks out. Then new evidence brings her back to the forefront of the investigation. Leading the investigation is DCI Helen Lavery. It is her first murder investigation and she is determined to bring the guilty party to justice. I w This is the first of Jane Isaac's books that I have read, but I can tell you that it definitely will not be the last! Anna arrives home after work, and to her surprise finds the body of stranger in her apartment. Of course she becomes the first suspect, but her alibi checks out. Then new evidence brings her back to the forefront of the investigation. Leading the investigation is DCI Helen Lavery. It is her first murder investigation and she is determined to bring the guilty party to justice. I won't include any spoilers, you'll need to read it for yourself to find out what happens. You will NOT be disappointed! I was drawn right into the story, and found myself not wanting to put this book down. It was very well written, and the mystery to who the murderer really is, is not easily deduced which is a definite plus for me. I can't wait to read more about DCI Helen Lavery! She is balancing work and family life, and all of the craziness that goes along with it. It will be interesting to see if there is more written about her family life and how she copes with everything. Jane Isaac's An Unfamiliar Murder Is An Engrossing Read! The director Alfred Hitchcock always said he was fascinated by stories whereby someone is arrested for a crime they say they didn’t commit, but the evidence is overwhelmingly stacked against them. The author Jane Isaac must prescribe to the same philosophy, since right from the start the reader becomes drawn into a chillingly frightening situation when a young woman, Anna Cottrell, comes home after a day of work and finds a stranger’s dead Jane Isaac's An Unfamiliar Murder Is An Engrossing Read! The director Alfred Hitchcock always said he was fascinated by stories whereby someone is arrested for a crime they say they didn’t commit, but the evidence is overwhelmingly stacked against them. The author Jane Isaac must prescribe to the same philosophy, since right from the start the reader becomes drawn into a chillingly frightening situation when a young woman, Anna Cottrell, comes home after a day of work and finds a stranger’s dead body in her living room. Arrested and thrown into jail, she becomes suspect number one as the evidence starts to pile up against her and members of her family. Due to the diligent and keen police work of Detective Chief Inspector Helen Lavery, we find out many answers and even find out about Lavery’s personal life. Why did I leave this languishing on my Kindle for so long? I won't make the same mistake with Book 2! "Arriving home from a routine day at work, Anna Cottrell has no idea that her life is about to change forever. But...becoming prime suspect in a murder enquiry is only the beginning. Her persistent claims of innocence start to crumble when new evidence links her irrevocably with the victim... Leading her first murder enquiry, DCI Helen Lavery unravels a trail of deception, family secrets and betr Why did I leave this languishing on my Kindle for so long? I won't make the same mistake with Book 2! "Arriving home from a routine day at work, Anna Cottrell has no idea that her life is about to change forever. But...becoming prime suspect in a murder enquiry is only the beginning. Her persistent claims of innocence start to crumble when new evidence links her irrevocably with the victim... Leading her first murder enquiry, DCI Helen Lavery unravels a trail of deception, family secrets and betrayal." I read a lot of crime fiction and sometimes the crime dominates my attention, sometimes the detective's own story is more intriguing. An Unfamiliar Murder gives the reader a 2-for-1 experience. The initial crime scene is presented early on and is shocking and original. Then we meet DCI Helen Lavery and her family who drew me in and made me a part of their domestic drama. Anna Cottrell arrived home from work one day to find the body of a dead man in her flat. Despite her protests of not knowing him she became the prime suspect of his killing. It is up to DCI Helen Lavery to investigate the case where family intrigue and secrets are central to the case. She needs to uncover which of the secrets are relevant to her investigation and which can stay secrets. Helen is balancing leading her first murder case with a not altogether deputy along with being a single mother Anna Cottrell arrived home from work one day to find the body of a dead man in her flat. Despite her protests of not knowing him she became the prime suspect of his killing. It is up to DCI Helen Lavery to investigate the case where family intrigue and secrets are central to the case. She needs to uncover which of the secrets are relevant to her investigation and which can stay secrets. Helen is balancing leading her first murder case with a not altogether deputy along with being a single mother of teenage boys. She is a very well written character and I'm sure many people will be able to empathise with her. The complexity of the relationships between the characters is fascinating and I really enjoyed each layer being prised away and another revelation being uncovered. For anyone who enjoys a good police procedural with great characters I would wholeheartedly recommend this book. I'm planning to download the next book in the series very soon. I was lucky enough to receive an advance copy of this book from The Book Club (TBC) in exchange for my honest review. Anna returns home after work, discovers not only a break-in at her flat but a stabbed dead body of a stranger and becomes the prime suspect! The character of DCI Helen Lavery leads her first murder enquiry and uncovers a trail of deception. This is an extremely well written and thrilling read by Jane Isaac. Great characters and a great story. Gripped from the beginning. You just wa I was lucky enough to receive an advance copy of this book from The Book Club (TBC) in exchange for my honest review. This is an extremely well written and thrilling read by Jane Isaac. Great characters and a great story. Gripped from the beginning. You just want to keep on reading until the end but actually not want it to end! I was given a copy of this book to read through The Book Club (TBC) in return for an honest review and am so glad I took the opportunity. The author was new to me and as far as debuts go, this is pretty good. Loved all the characters, learning about their different pasts and wondering how it would all tie together as the investigation developed and will definitely be reading more from this Author. A well written and gripping thriller. I really enjoyed this book, I loved how instantly I was pulled into the story. This was my first ever read of Jane Isaac's books, it certainly will be the first of many, such a brilliant author! This book was so good that I actually forgot to add it to my "currently reading" on Goodreads until I had finished, such a page turner, you don't want to put it down. So, I've just finished reading An Unfamiliar Murder and I'm finding it very easy to review - I loved it! A fast paced, twisty, turning tale that kept me engrossed right from the off. Great characters, mystery and intrigue all the way through. A thoroughly enjoyable few days of easy reading. I thought this was an encouraging debut. The story had a murder, family secrets and some action. It will be interesting to see how the character of Helen develops in the second book. I'd like to thank TBC and the author for the ARC. Good book, but I didn't particularly like the main character, Anna. This was always going to be a tricky read for me as I love the author's Will Jackman series and this is earlier work (and he's not in this). Jane Lavery grew on me as the book progressed and I will read book 2 to see how she develops. The opening chapter definitely grabs your attention and you need to read further to see what lead to that point. While some of the police procedural stuff didn't seem quite right to me, I thought the author was spot on with the characters of the acting DI and the Su This was always going to be a tricky read for me as I love the author's Will Jackman series and this is earlier work (and he's not in this). Jane Lavery grew on me as the book progressed and I will read book 2 to see how she develops. This started well but got a bit slow in the middle. The Truth Will Out, the second in the DCI Helen Lavery series, was nominated as 'Thriller of the Month - April 2014' by E-thriller.com and winner of 'Noveltunity book club selection - May 2014'. Jane' s seventh novel, Presumed Guilty, is the second in the highly acclaimed DC Beth Chamberlain (Family Liaison Officer) series. The third DC Beth Chamberlain novel is scheduled for release in 2019, along with a new DCI Helen Lavery novel.